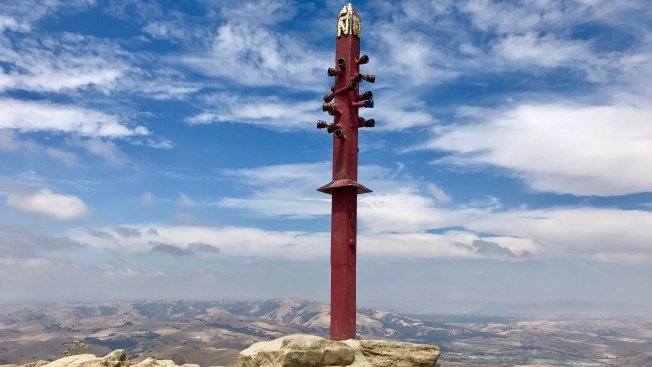 Poking out of the top of Mission Peak in the East Bay stands the so-called "Mission Peeker," a colorful pole with a unique history to its name. The climb strains the legs and the lungs. The landscape is shrouded with bone-dry brush and swirling dust clouds. There's hardly any shade to seek shelter from the blistering California sun. What sounds like a grueling trek through a parched desert in the middle of nowhere is actually one of the most popular hiking destinations in the Bay Area: Mission Peak just east of Fremont. While the roughly 2,000-foot climb to the peak offers a wide array of health benefits, it's the towering pole at the summit — the so-called "Mission Peeker" — that seems to capture the attention of interested outdoor enthusiasts and folks passionate about sharing their athletic feats on social media. "It's an incredibly popular hike," Ira Bletz, a Regional Interpretive and Recreation Services Manager for the East Bay Regional Park District, said. "People get up there and they really love the idea of taking a picture up there." 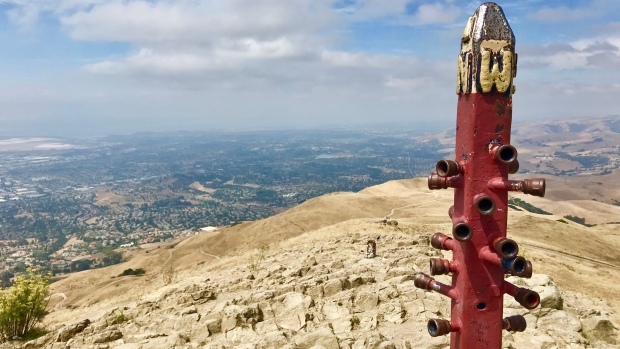 The famous pole captured in photos shared across Instagram, Facebook and other social media platforms for years now has been in place atop Mission Peak since 1990 thanks to mastermind and creator Leonard Page, according to Bletz. Protruding out of the rocks at the summit, the now red-bathed pole features north, east, south and west direction markers at the top accompanied by a number of knob-like attachments below. While the protruding attachments make for useful climbing holds for hikers posing for triumphant photos, they are actually designed to be sighting tubes, allowing accomplished hikers to literally take a peek at the various peaks that stick out above the Bay Area. "[Page] wanted it to show how the whole Bay Area was connected so from that one spot you could look and see the other peaks around the Bay Area," Bletz said. 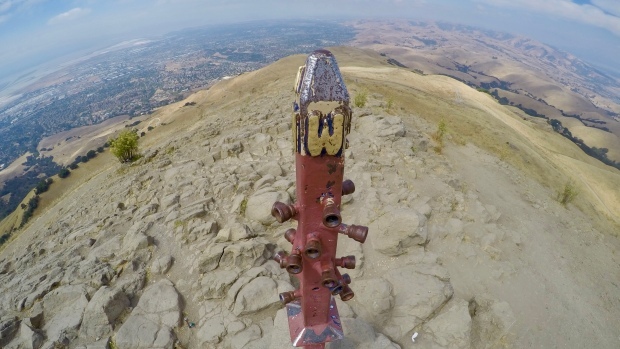 What can't be directly seen at Mission Peak is the time capsule resting inside the base of the pole. When it's opened in 2090, history fiends will find a bottle of wine, a replica Ohlone Tribe charm stone, photographs and other "things of the time" from the early 1990s, according to Bletz. "I think [Page's] idea was to use [the pole] to kind of promote environmental awareness and connecting people with the environment around them," Bletz said. Making the ascent up Mission Peak starts at either Ohlone College or the end of Stanford Avenue in Fremont. From the Stanford Avenue trailhead, hikers encounter a wide dirt path for most of the climb sandwiched between grassy hillsides, the occasional herd of sometimes-vocal cows and the rare tree cluster offering limited protection from the searing sun. Hikers are encouraged to bring plenty of water for themselves and their pets as well as ample sunscreen. Sturdy shoes and thick socks are also highly recommended to prevent against blisters. Just before conquering the summit, hikers come face-to-face with two short but steep climbs. While the final stretch proves taxing with its narrow, rock-littered ascent, the apex offers hikers the ultimate payoff. Hikers can catch glimpses of Mount Hamilton, the Santa Cruz Mountains, Mount Diablo, Mount Tamalpais and even the Sierra Nevada from the top of Mission Peak on a clear day. "I think it's popular because it's like the top," Bletz said. "It's Mount Everest. It's the high point, and you know you're at the high point. You don't have to wonder if you've reached the summit or anything." While all people hike at different paces, the East Bay Regional Park District advises that hikers give themselves roughly five hours to complete the excursion to and from the summit. "It's not the easiest hike in the world, but it's not insurmountable," Bletz said.